Our upscale, beautiful boutique hotel is appropriately located on the Museum Reach of the world-famous River Walk. 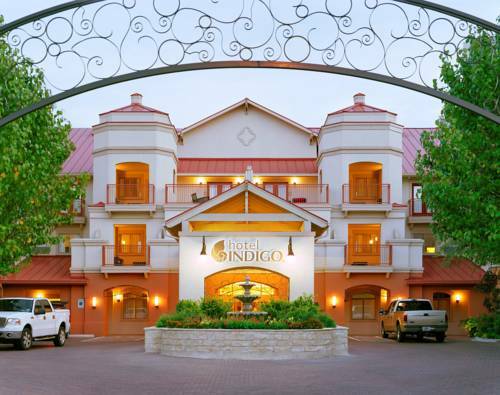 Situated between financial and medical districts, the Hotel Indigo San Antonio River Walk hotel is a grand, Spanish-style villa located directly on the River Walk in our thriving arts community. Our hotels local artwork showcases the areas symbolic bridges, while the outdoor pool, terrace and guest room balconies offer views of the river that shaped our neighborhood. Our event spaces host 80 guests, or venture out and hop aboard a water taxi right behind our hotel to meander downstream. Were near many of downtowns popular attractions, including the Alamo, with easy access to the Blue Line Trolley. No pillars, all carpeted, courtyard access. Can be partitioned into two rooms, 825 sq feet each. Board table for 8 people, large chairs, private bath, serving area for breaks & meals. Perimeter seating for 4 more people. Surrounded by the romance of the River Walk, Rivercenter is as scenic and the shopping is spectacular. The Amtrak Texas Eagle. Call station for hours of operation. This historic 18-hole golf course is located near the heart of downtown San Antonio, in historic Brackenridge Park. It opened for play in 1916 as an 18-hole championship course and is the oldest municipal course in San Antonio. For more than 35 years, this 750-foot tall tower has offered residents and tourists of San Antonio, the most breathtaking view of the Alamo City. Visitors can dine at the Tower's revolving restaurant or enjoy the scenery from the observation deck. The Institute of Texan Cultures, through its research, collections, exhibits and programs, serves as the forum for the understanding and appreciation of Texas and Texans.The grounds of the Institue is location for famous Folklife Festival- held each June. Enjoy quality time with friends and family at Alamo Quarry Market, just minutes from downtown. Nestled in an environment rich with history, our fabulous collection of stores, restaurants and theatres will inspire you to shop all day and play all night. For operating hours, tickets, directions or general information, visit www.sixflags.com/fiestaTexas. For operating hours, tickets, directions or general information, visit www.seaworld.com/sanantonio.